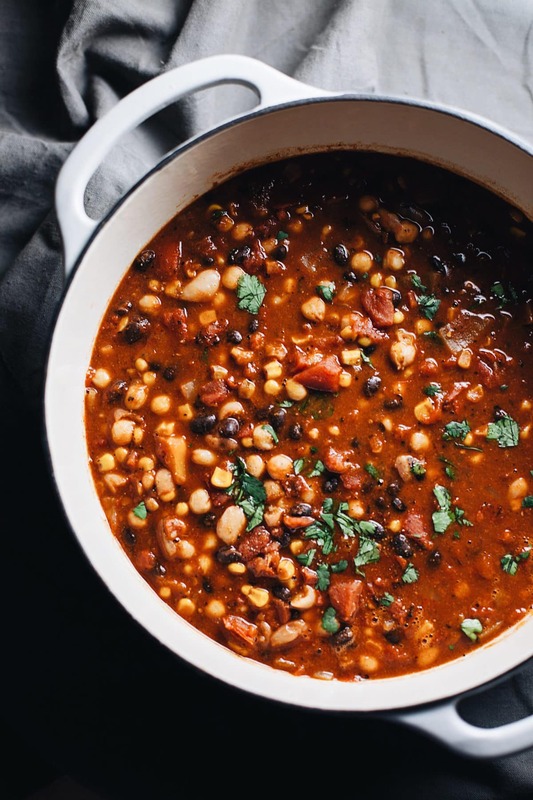 This Healthy Vegetarian Bean Chili – a one pot soup with a flavorful tomato base, and is full of satisfying plant-based protein. So delicious and the perfect soup to make for Fall/Winter! I love a good pot of soup. 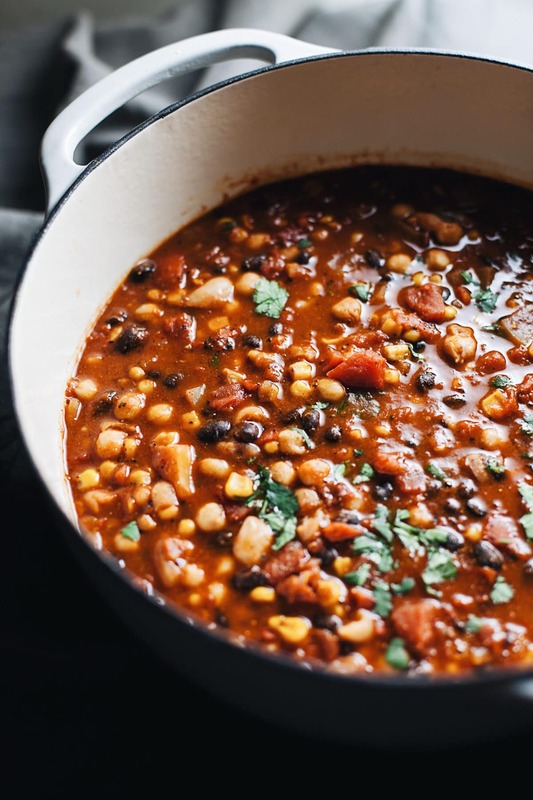 And this Healthy Vegetarian Bean Chili has been one of my favorites lately – it is an easy one pot meal and is so full of flavor. All you need is a pot or dutch oven and a handful of ingredients. This chili is also a meatless recipe and contains 3 different types of beans, a little bit of corn, all in a flavorful tomato base. What Beans Are Best For Chili? Pinto beans work for both red and white chili. Kidney (regular & large) and black bean, red, northern and navy work great as well – don’t be afraid to mix them up. A good, firm bean is essential so that it doesn’t disintegrate during the cooking process. What Vegetables Can You Put In Chili? Chili is extremely versatile when it comes to ingredients. Depending on the vegetables you prefer – you can add corn, zucchini, carrots, green or red bell peppers, and tomatoes (diced, crushed, or tomato sauce). 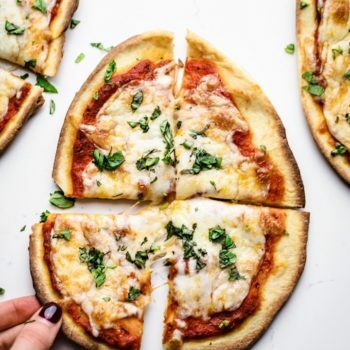 This recipe is super easy to make in an instant pot or slow cooker. Place all of ingredients in pot for slow cooker set for 2 hours on high or 3 to 5 hours on low. Pressure cooker set to 40 minutes on high. If you don’t have all the beans listed for this soup you can also do navy, pinto, or kidney beans. Add tortilla chips on top for extra flavor and crunch with your soup. Use fire roasted diced tomatoes versus regular diced tomatoes for extra depth of flavor. Make sure you let this soup simmer for proper amount of time (1 1/2 hours) to thicken and develop in flavor. Use a dutch oven to cook your soup if you have one. Dutch ovens are a versatile cooking vessel and perfect for slow cooking like soups and stews. Here’s my dutch oven of choice. This soup is amazing year round – it’s comforting and cozy for chili fall/winter nights. Or just to have any other day for a meatless dinner that’s healthy and delicious. This vegetarian bean chili is satisfying and hearty, easy to make, and is absolutely delicious! Top with cilantro, tortilla chips, and you have yourself the perfect bowl of soup. 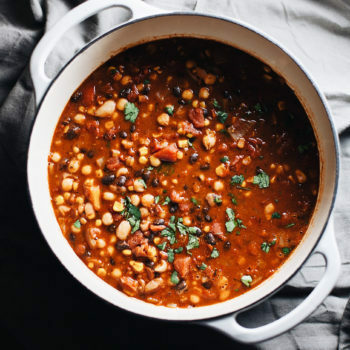 A satisfying and flavorful chili with a tomato base, chili seasoning, and plant-based beans for protein. 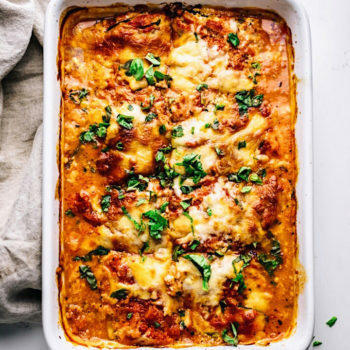 So delicious and perfect for Fall/Winter! In a deep pot saute diced onion in olive oil with a little salt for 3-5 minutes on medium heat, onions should be browned and soft. Add crushed/diced tomatoes, water, then stir in beans and spices. Let chili simmer for 1 hour on low heat, stir occasionally to avoid burning. Add corn for the last 10 minutes. Adjust seasoning and salt to taste if needed. Serve in a bowl with fresh cilantro, cheese, and tortilla chips if desired. If you don't have all the beans listed for this soup you can also do navy, pinto, or kidney beans. If you have one, use a dutch oven to cook your soup. Dutch ovens are a versatile cooking vessel, and are perfect for slow cooking like soups and stews. This is the brand I use. Beautiful photos! This chili looks so hearty and soothing! This looks so comforting and delicious! 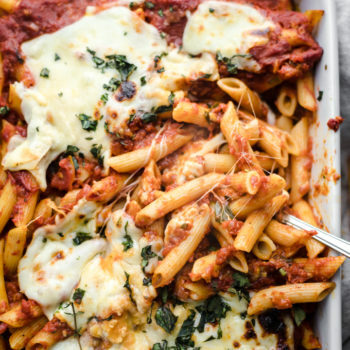 The perfect dinner for a chilly fall night! Awesome. It’s the perfect time of year for chili. Thanks for posting. This chili looks hearty and warming and delicious! Yum! Chili can be such a great vegetarian dish. My wife is vegetarian and I am not, but this is one recipe we can share. Sometimes we do add Beyond Meat Fiesty Crumbles, but I don’t think it needs it. Made this tonight for the family while there is ice on the tree limbs and the day saw no sun. Everyone loved it! The 1-1/2 hour cook time felt long but I kept tasting and the flavors melded more the longer it cooked. Thanks, I will make this one again.